Checkpoint modifiers don’t work for all patients, and for others they can cause dangerous autoimmune responses. The regulation of every immune response is highly balanced by a cascade of stimulatory and inhibitory signals. Any imbalance could lead to uncontrolled infection or autoimmunity. Various checkpoints are widely incorporated into the immune system that are crucial for maintaining self-tolerance and for controlling the duration and amplitude of physiological immune responses. These checkpoints are generally stop signals for proliferating immune responses and are mainly based on ligand-receptor interactions. One major mechanism of immune resistance of many tumors is their hi-jacking of checkpoints, particularly within regulatory pathways of T cells. Checkpoint modifiers: Membrane-bound ligand-receptor interactions can be easily modified by monoclonal antibodies (mAbs), also known as checkpoint modifiers. 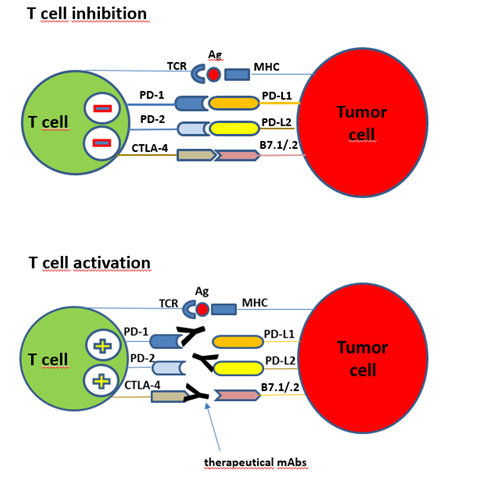 While therapeutical mAbs such as anti-Her2 directly targets epitopes on tumor cells, immune checkpoint mAbs don’t target tumor cells but restore the antitumor immune activities of cytotoxic T cells by blocking immune checkpoint molecules on T cells or their ligands on antigen presenting and tumor cells. Checkpoint blockers and vaccines. The combination of immune checkpoint modifiers with cancer vaccines offers a new strategy to treat cancer diseases. First, checkpoint blockers remove the brakes on T cells that cancer uses to suppress the immune response, and secondly, tumor antigens delivered by the vaccine can meet now revitalized T cells. 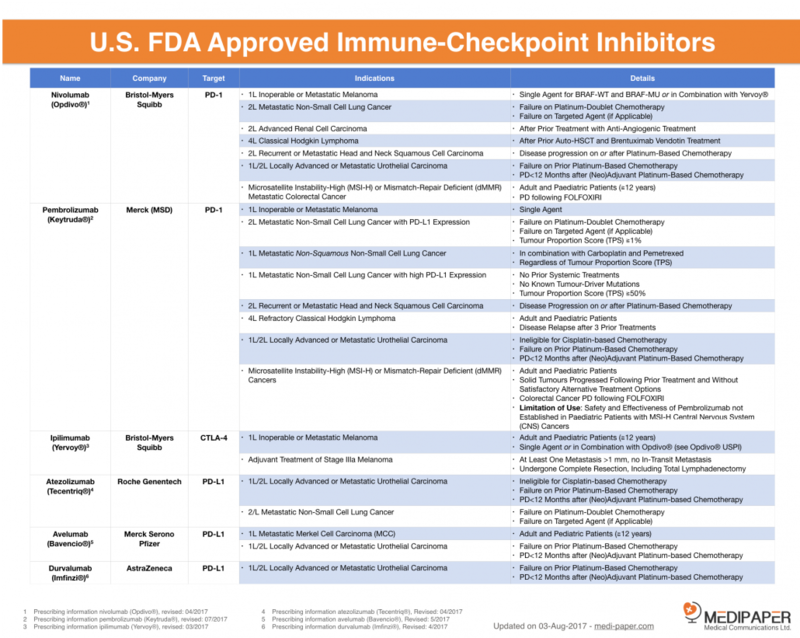 There are six U.S. FDA approved checkpoint modifiers, five are directed against PD-1/L-1 and one against CTLA-4 receptor. Common side effects of Keytruda (pembrolizumab, Merck & Co. Inc.) include fatigue, itchy skin (pruritus), diarrhea, decreased appetite, rash, fever (pyrexia), cough, difficulty breathing (dyspnea), musculoskeletal pain, constipation and nausea. Keytruda can cause serious conditions known as immune-mediated side effects, including inflammation of healthy organs such as the lungs (pneumonitis), colon (colitis), liver (hepatitis), endocrine glands (endocrinopathies) and kidneys (nephritis). Complications or death related to allogeneic hematopoietic stem cell transplantation after using Keytruda has occurred. In August 2017, following deaths in two Keytruda trials, the FDA halted the pair of Merck studies. And now, it’s warning the public, health care professionals, clinical investigators and others about what’s at stake. Merck Withdraws EU Application for Frontline Pembrolizumab Combo in NSCLC. Common side effects of Opdivo (nivolumab, Bristol-Myers Squibb Company) a single agent include fatigue, rash, musculoskeletal pain, pruritus, diarrhea, nausea, asthenia, cough, dyspnea, constipation, decreased appetite, back pain, arthralgia, upper respiratory tract infection, pyrexia. SEPTEMBER 7, 2017: The U.S. Food and Drug Administration has placed a partial hold on three clinical trials testing Bristol-Myers Squibb’s immunotherapy Opdivo in combination with other medicines for multiple myeloma due to risks seen in similar studies involving a rival drug, the company said on Wednesday. Roche’s Tecentriq, fail to work in as many as 80% of patients—a problem that their manufacturers have been trying to solve. Now Roche is uncovering data from a Tecentriq trial in bladder cancer patients that could provide clues to countering resistance. Atezolizumab (Tecentriq) missed the phase III IMvigor211 trial’s primary endpoint of improving overall survival (OS) in the second-line setting for patients with locally advanced or metastatic urothelial carcinoma (mUC), according to Genentech, the manufacturer of the PD-L1 inhibitor.